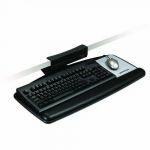 The AKT80LE gives you the ability to control height and tilt simultaneously, independent of the mouse platform. 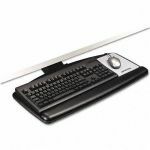 It's perfect for shallow workstations where mounting depth is at least 17.5". Compatible with ergonomic keyboards. -Star-knob adjustment controls height and tilt simultaneously. -Gel wrist rests for keyboard and mouse platforms add comfort by minimizing pressure points. Leatherette cover lasts longer than fabric-covered wrist rests and is easier to clean. -Super adjustable separate mousing platform mounts left or right and needs no tools to adjust. 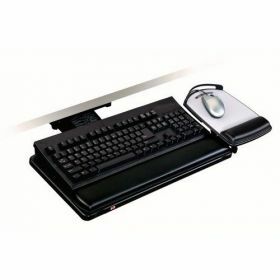 Platform slides left and right over the keyboard, tilts forward and backward and adjusts up and down to the same level as the keyboard platform. Features 3M™ Precise™ Optical Mousing Surface.